Our range of products include cpvc injection moulding machine. 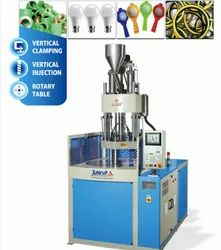 Cpvc Brass Fitting Rotary Injection Moulding Machine. Upvc Brass Fitting Rotary Injection Moulding Machine. Clamping force start from 25 to 250 ton. Shot weight start from 60 to 2500 gm. 1. Suitable for Cpvc, Upvc, Ppr, Pp brass type fittings. 3. Suitable for ball valve overmoulding. 4. Saving time of picking and placing insert. 5. During the refilling and cooling time, Operator can work picking and placing easily.